I just got back from two weeks in Korea complete with tragic, disconcerting, but ultimately, insignificant North-South skirmishes and War Games. 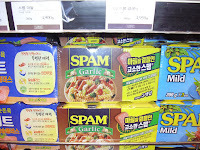 Garlic, like the Garlic Spam above, is big in Korea. 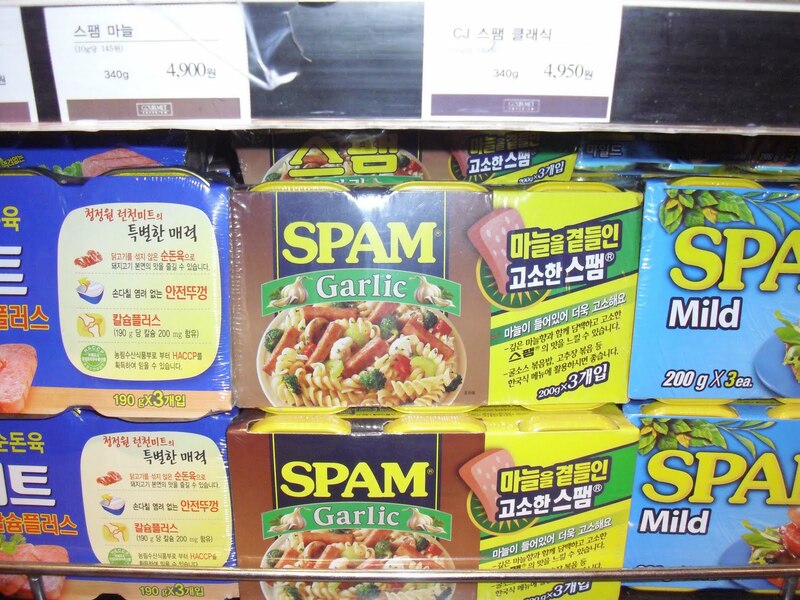 Koreans are the world's largest per capita consumers of garlic, eating a staggering twenty-two pounds a year. (In comparison, Americans consume a paltry 2.6 pounds). In fact, the importance of garlic dates back to Korea's incarnation as a nation. According to an ancient legend. God sent his son to earth to build a peaceful kingdom and be its king. One day, a tiger and a bear who observed the happy and civilized lives of man went to the king and asked him to reincarnate them in human form. The king gave them twenty cloves of garlic and a handful of mugwort and told them to go into a cave to pray. He told them, “ If you eat these and do not see sunlight for one hundred days you will become human beings." The impatient tiger gave up and returned to the wild, but the bear prayed and emerged as a woman. As time went on, the so-called bear-woman desired a child of her own. Touched by her prayers, the king transformed himself, temporarily, into a man and married her. Together, they had a son, Tangun. Tangun succeeded his father as king and became the founding father of Korea. Thus Korea was born, and garlic and mugwort became the country’s first recorded medical herbs. An earlier post gave a recipe for kimchi (one of over 180 varieties found in Korea). Below, please find a recipe for chojang sauce, a sweet-spicy red chili condiment that 's enjoyed at Seoul's many all-you-can-eat raw tuna restaurants. It's my favorite Korean sauce. Special thanks go out to super blogger Daniel Gray of Seoul Eats who introduced me to Korean raw tuna at Lee Chun Bok, the culinary highlight of my Korean visit. Gray is one of the reigning authorities on Korean cuisine and worth seeking out if you're visiting Seoul with hopes of experiencing Korea's exquisite cuisine. Gray, who was raised in Delaware, is also a partner in Seoul's O'ngo Food Communications which that offers Korean cooking classes and culinary tours. Mix all ingredients together until well-blended. If the consistency of the is too thick, thin out with some warm water. Use immediately or refrigerate for later use.